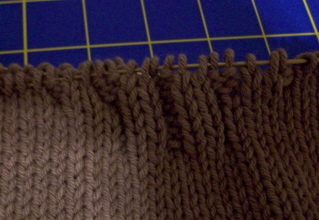 This is going to be a loose, comfy sweater and I just can't stop knitting on it. 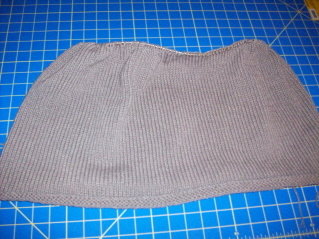 I've even decided to actually knit the sleeves in the round as specified in the pattern. No knitting-flat mods for me. I think we need to alert the media. A small part of the reason that Leaves is once again on hold is that I don't think I have enough yarn to finish the project. I should have enough but I'm not finding the skeins I thought I had on my yarn shelves. Michael's, of course, is out (that darn 30% off sale!) so... I'm waiting & dithering. At least it gives me a good excuse to pull out my yarn to today & have a look-see. ::grin:: Any excuse for playing in stash is a good excuse. I'm also going to take time out today (between grocery shopping & my massage...poor me!) to sew the binding on Colin's quilt, then I'll just have the hand-sewing to finish before Tuesday. THAT, at least, will be done!